Holly Willoughby opted for a very stylish denim outfit on Wednesday as she hosted I’m A Celebrity… Get Me Out Of Here! alongside Declan Donnelly. The 37-year-old presenter looked nothing short of sensational as she boldly rocked double denim, in a short blue skirt and shirt. Holly’s outfit did not come cheap though, as all components added up to cost almost £500. The blonde bombshell sported an axelle shirt from ba&sh. The denim-look shirt features a ruffle neck, and is still available for £165 online. Meanwhile, she teamed it with a reworked edition of Madewell’s rigid denim straight mini skirt, which can still be bought for £43.96. The This Morning star teamed her outfit with a pair of chunky brown boots, which her stylist confirmed are the Nanette combat boots from Grenson. Fans can get their hands on the tan shoes for £280, which are available online through shopbop. Holly’s outfits have been a huge hit with viewers since she hit screens as Ant McPartlin‘s replacement, with many questioning the star about where they could find her daily ensembles. However, fans were recently talking about her look for a different reason, as they questioned why she appeared to have changed mid-way through Anne’s Bushtucker Trial. At one moment Holly was wearing a black sleeved top without a pattern, and the next scene showed it featuring a design on the front. But ITV have now cleared up what happened – and no, Holly did not change her top during the show. It was in fact down to a “mistake” in editing, after producers spotted Holly’s jumper had a logo on it. With this not allowed on screen, not just on ITV but other shows and channels too, the decision was made to “blur out” the top as to not re-film the trial. 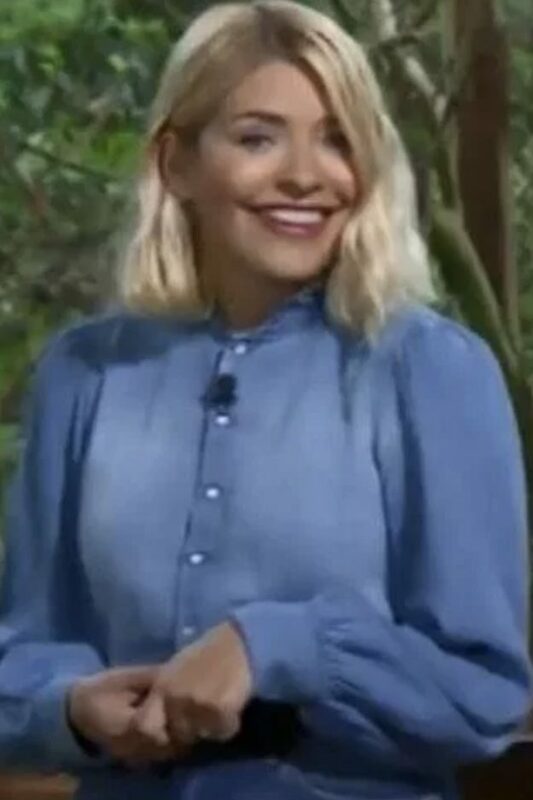 Holly Willoughby’s I’m A Celeb outfits: Where are the presenter’s clothes from?